The East Coast of Australia is the most visited place in this amazingly beautiful and unique country. 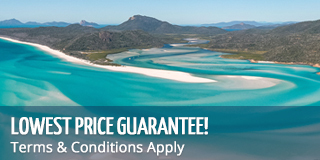 It has top destinations include Cairns, the Whitsundays, Fraser Island, Brisbane and more! It's known for its coastal towns, sandy beaches and its many national parks, including the Great Barrier Reef Marine Park. It's ideal for an extended road trip, where you can visit as many destinations as you want, or you can opt to train, bus, or even fly as you make your way up or down the coastline. Below are some of the top destinations on the East Coast of Australia. Cairns is undoubtedly the gateway to the Great Barrier Reef and a popular destination for both Australian travellers and international tourists. It is often the first (or last) stop on an East Coast trip, sitting in Tropical North Queensland! From here you can not only head to the amazing World Heritage Great Barrier Reef, but you can also visit the Atherton Tablelands and the Daintree Rainforest. Mission Beach is made up of 4 beach villages that are linked by a 14 km stretch of sandy beach! The area is famous for its cassowary population, which are often spotted on the beach itself as they make their way out of the forest. This town is said to be where the Wet Tropics Rainforest meet the Great Barrier Reef and is a base for visiting islands such as Dunk, Bedarra and Hinchinbrook. Townsville is another great stop along the East Coast of Australia. Perhaps best known for its proximity to Magnetic Island which is not far off the coast, it is often visited before or after this island stop! Airlie Beach is the found in the heart of the Whitsundays and is the main launch point to visit the tropical island chain. Many tours depart from Airlie Beach to visit iconic locations such as Whitehaven Beach, Hill Inlet Lookout, Heart Reef and the Outer Great Barrier Reef. Mackay is the midway point between Brisbane and Cairns along the East Coast. It is known for its output of sugar cane and is nicknamed the Sugar Capital of Australia. The town is also known for its proximity to over 30 beaches! Rockhampton is located in Central Queensland and is found on the banks of the Fitzroy River. It experiences an average of 300 sunny days a year, making is a great stop to enjoy great weather! Agnes Waters is the most northerly surfing beach on the Eastern Coast, making it a great place to try surfing for the first time! 1770 is a neighbouring village, not far from Agnes Water that is known for its historical significance in the foundation and discovery of Australia. Hervey Bay is known for its proximity to the famous Fraser Island, the world's largest sand island, as well as it's annual whale watching. Many whales migrate past the Fraser Coast, and several tours depart from Hervey Bay to see these amazing marine creatures! Rainbow Beach is named for its colourful sands, which can be easily spotted while you are enjoying some surf! This is another stop on the way to Fraser Island, with a ferry to the island only a 10 minute drive away. Noosa is a small beach town and is another popular stopping points before going to Fraser Island. It is larger than Hervey Bay or Rainbow Beach, with many people staying here before visiting the island. Maroochydore is found on the Sunshine coast and is a popular destination among locals and international travellers. It's close to iconic destinations such as Australia Zoo (also known as the Steve Irwin Zoo), Sea Life Aquarium and the Glass House Mountains. Brisbane is the capital of Queensland and a main stopping point for many travelling along the East Coast as it is the area's largest city! There are many international flights that land in Brisbane daily, meaning many tourists start or end their holiday here! Surfers Paradise on the Gold Coast is one of the busier destinations on the East Coast. It has many high end shops, casinos, restaurants, shopping centres and Australia's tallest skyscraper. It's one of the best places to stop and enjoy the nightlife! Tweed Heads is found on the New South Wales and Queensland border, and is popular for its beaches and closeness the the beautiful Gold Coast. Byron Bay was once just a surfer town with a small town vibe that how now become one of the buzzing hubs of the Cast Coast. It still maintains its great personality, but has plenty of shops, restaurants and beaches full of locals and tourists alike.